Whatever their stage of economic development, all countries, across all sectors, have a workforce supporting the preparation of financial information at an operational level. Timely, credible and reliable financial information is fundamental to successful investment, to effective governance and to the quality of service delivery both by this workforce and by professional accountants that rely on it. CAPA generally refers to this workforce as ‘accounting technicians’, although in many other countries the term accounting technicians (ATs) is not used at all and a different terminology such as bookkeeper, public finance accountant or accounting administrator may be used instead. Watch the following video or read this flyer for a brief introduction about the publication. 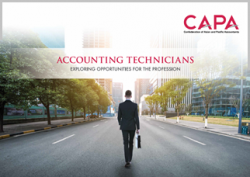 Accounting Technicians Introduction Video from CAPA Ltd. on Vimeo. Note: The Accounting Technicians publication is provided for use and reference at no charge to any professional accountancy organisation and other relevant organisations. However, written permission from CAPA is required to reproduce, store, transmit or make other similar uses of the materials contained in any of the above, both in printed or digital formats and by electronic links. Contact the CAPA Secretariat for permission. Minor typographical errors on page 26 have been corrected on the digital format of the publication.